We have trained hard for the upcoming TBR Dream Marathon. 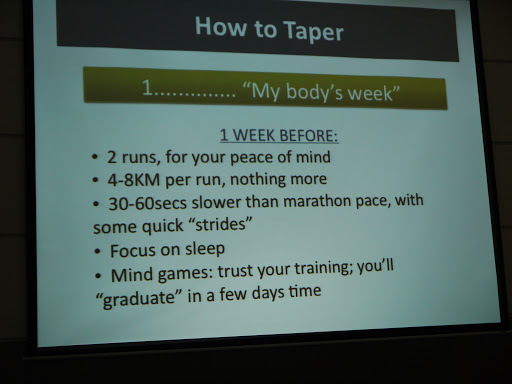 After running our longest run this weekend, it’s now time for us to taper so we can arrive at the starting line fresh, in top form physically and mentally, and ready to go! 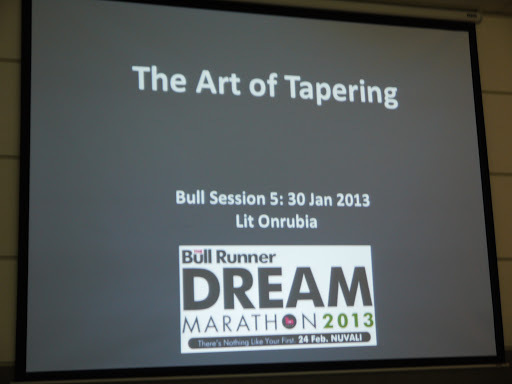 For the fifth Bull Session, we had three speakers: Coach Lit Onrubia, Coach Jim Lafferty, and Christine Jacob-Sandejas. 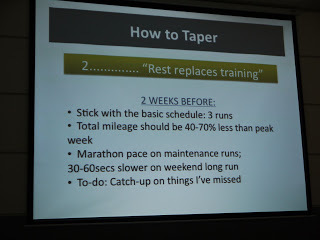 Coach Jim briefly talked about the many silly mistakes runners do on the final weeks and days before the race. Panic and train very hard. Carbo load the wrong way. Remember: You’re going to finish. You’re going to be fine. Relax. Don’t worry about your time. Just finish. 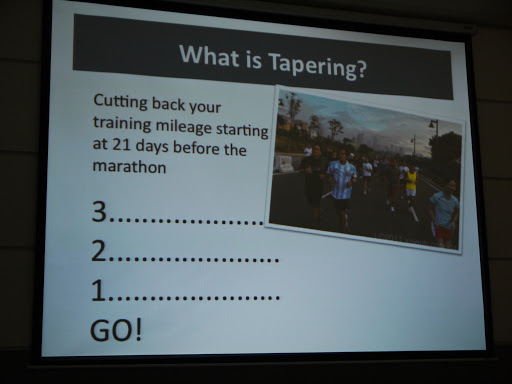 Christine (TBRDM 2011) shared her experience and some tips on running the Dream Marathon. Congratulations! You’ve come this far. Visualize the race. 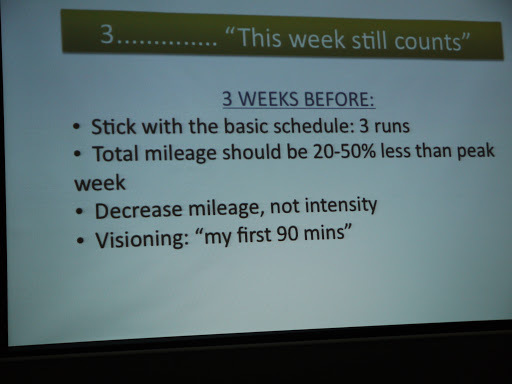 Have a plan on how to attack the race. First half, relax. Start working on the second half. In running in Nuvali, go slow uphill and make up for it downhill (but don’t sprint). Start slow. The first 21k should feel like nothing happened. Keep your legs fresh and you will finish fast and strong. Gummy bears, salt, buco juice are good. Practice drinking what they’ll give you on race day (Gatorade). Feed your brain before it tells you to stop. Run-walk early during the race. It may be a little disconcerting but you’ll have a great moral boost when you overtake many runners who become tired after the first half. Get enough sleep before the race. 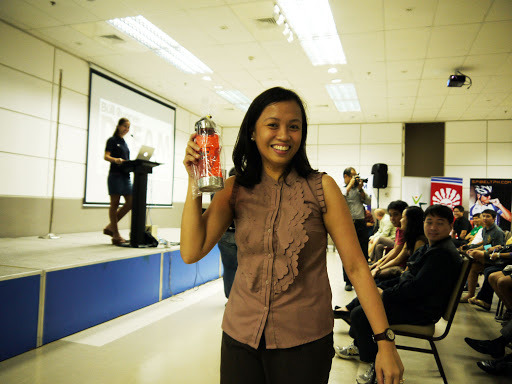 Watch this video when she gave a similar talk for TBRDM 2012. If you have trouble viewing this video click HERE. After the speakers, a very short Q and A was next. 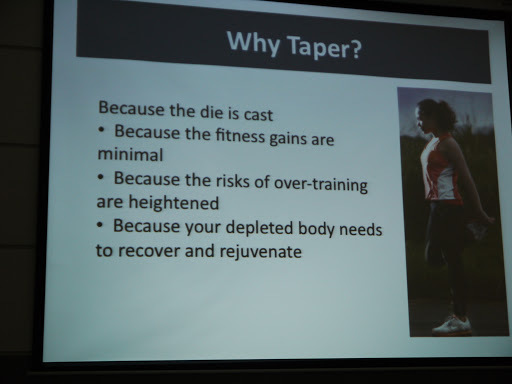 Q: Can we still crosstrain during tapering? Lit: No crosstraining for me. All I do is run as prescribed. Jim: No. No lifting of weights, no swimming, no yoga, no pilates, no core strengthening, etc. Let your body rest and heal. Trust that your body is ready. Let it recover and become stronger. Christine: 42k is no joke. Relax. Rest. 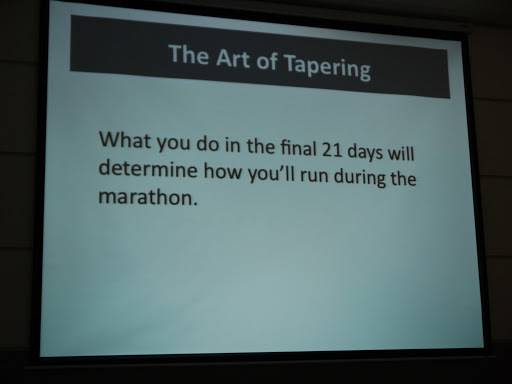 Tapering is your friend. Q: How about carbo loading? Jim: Don’t believe the gimmick saying that you have to eat a lot of pasta before a marathon. Do not go to buffets. Do not eat a lot of spaghetti. Just make your last two meals high carb. *Notes were taken from the 5th TBR Bull Circle as I understood the lectures and not verbatim by the speakers. 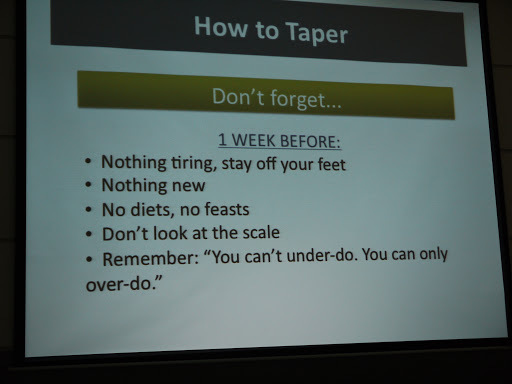 Tapering week starts! The last bull circle talks also boosted our morale for the big day. Thanks for sharing!